It's not easy being a superhero. Fired from your job because you were out fighting crime when you should have been delivering pizza. Failing college because all that vigilante stuff is really eating into your homework time. Always running late, always tired, always making lame excuses, always disappearing whenever danger threatens. and occasionally ending up with interesting stains on your underwear because you've accidentally put your superhero suit in the white wash.
Two years on from the first Spider-Man film, that's the situation facing our angsty arachnid hero, Peter Parker. Painfully conscious that his web spinning skills should be used to protect the good citizens of New York city, he's still desperate to hang up his body stocking and have a life of his own. Poor old Peter - can't tell the people he loves who he really is, can't have a girlfriend because his enemies will kidnap her and tie her up somewhere dangerous (which they do anyway). Er, hang on a sec, wasn't that the plot of the last film? In fact, substitute Willem Dafoe's sneering Green Goblin for Alfred Molina's rather more appealing Doctor Octopus and what have you got? 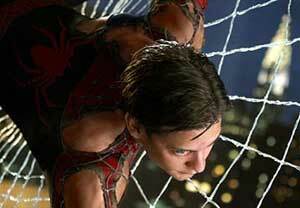 Yup, Spider-Man 1 with a different baddie. 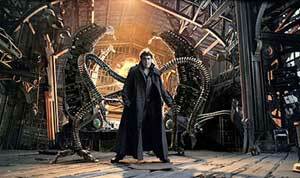 Having said that, Doc Ock, is a fairly superior bad guy. A brilliant scientist caught up in a ground-breaking experiment gone very wrong (amazing how many of them there are about, isn't it? ), he's somehow managed to end up with four evil robot arms welded onto his spine (quite why he felt it necessary to attach robotic arms to his spine in the first place is never really explained but I'm sure it made sense to him at the time). There's supposed to be some switch attached to the arms that stops them taking over his brain but needless to say the switch blows, leading to some rather excellent scenes of mental torture as Otto Octavius tries to fight off the sinister power of the megalomaniac arms as they begin to control his brain. Like Golum with Hoover attachments, Molina gives an affecting portrayal of crazed schizophrenia that raises Doc Ock above your usual two-dimensional film-of-the-comic-book baddie, making him a fitting foil for Spider-Man, the superhero with issues. As Spider-Man, Tobey Maguire walks a fine line between annoying and appealing, exuding nerdish charm and hapless, hopeless helplessness, before of course discarding his glasses, donning the ol' lycra and swinging to the rescue. But, like Doc Ock, he gets his big emotional scene: yes, I must admit I felt a lump in my throat as his bruised and battered body was passed across the heads of an awed and silent crowd he's just saved from a messy death in a runaway train. 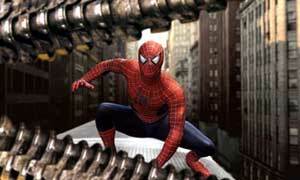 Both Spider-Man films have been praised for the way in which the CGI action scenes have been kept subservient to the human story of Peter Parker, the love of his life Mary Jane and his dear old Aunt May. Except that actually, the film could have done with fewer wobbly lips, brimming eyes and quavering 'there's a hero in all of us' speeches and a bit more evil robot arm action. Actually. And then there's the ending. Or rather, endings. Not once but three times you think the film's going to end, and end well, leaving the floor wide open for Spider-Man 3 to swing into the picture. So why, oh why, oh why did the studio decide to tack on a cheesy Hollywood ending and finish the film with one of the worst final lines since James Bond's 'Christmas only comes once a year'?